Hmmm...your quiche looks ever so delicious, dearest Kitty! I love oregano...it is one of my favourite herbs and I use it so often! It is perfect on pizza! And your tea cup is so gorgeous...love the autumn colours and the dainty design! May you have the most wonderful of Mondays, dear Kitty! Big hugs to you! I love your fall teacup! The quiche sounds wonderful! Your quiche sounds delicious, Kitty! I could eat quiche anytime. The little bundt cake/pudding looks scrumptious as well. And what a pretty teacup! I adore the robin on it as I do enjoy our little feathered friends so much. It is a very special teacup indeed! A lovely posting, my friend! Thank you for sharing and enjoy this coming week. I love a good quiche! YUMMY! Hi, Kitty. Love that tea cup. Love this season, too. My fave. Love quiche, but it has everything that is wrong for me right now. I am feeling better, so I just need to keep biting the bullet and doing the right thing! Oregano is one of my favorite herbs, Big in Italian cuisine. I have also grown it in a pot amd it survived a very snowy NY winter. You did it once again and have made a fabulous quiche recipe. I love that you out fresh oregano on top. Thanks for sharing this at Cooking and Craftinh with J & J. We love having you. Enjoy the week. What a pretty tray you've set up outdoors, Kitty. I love the plaid cloth and fall-colored flowers! Your teacup and saucer are just gorgeous -- you really do have a wonderful collection of teacups!! The food looks delish, as always! I've never made a crustless quiche, but have thought about trying one in the past. We really like quiche Lorraine here, so I always just make the traditional kind with crust. Your quiche does look tasty and easy. Thanks for sharing this recipe with us, Kitty, and I hope you have a wonderful week!! Kitty, your flowers are beautiful and Traders Joes does have a lovely selection. Your friend has given you a beautiful treasure. The Royal Doulton pattern speaks fall and the bird is darling! I'm glad we are having cooler weather and the recipe is great for any time! Have a grand week! Dearest Kitty, your tea cup made my heart swoon....it's absolutely precious! And your quiche and pretty table setting looks delightful. Thanks for sharing with Roses of Inspiration. It's so nice to be visiting on time this week! Love you! What a good idea to have this all ready in the freezer for a delicious, protein-filled breakfast. And whatever that little bundt cake thing-y is, it looks delicious, and so pretty with the colorful berries. I love your teacup; it's perfect for fall. Aren't sunflowers the cheeriest flowers? Lovely vignette Kitty. Sweet robin autumn tea cup. I don't think of robins in the fall as they all skedaddle pretty early so it is a unique combination for me. Never thought of having quiche for breakfast, but that has to be a great source of protein plus being delicious. Perfect! 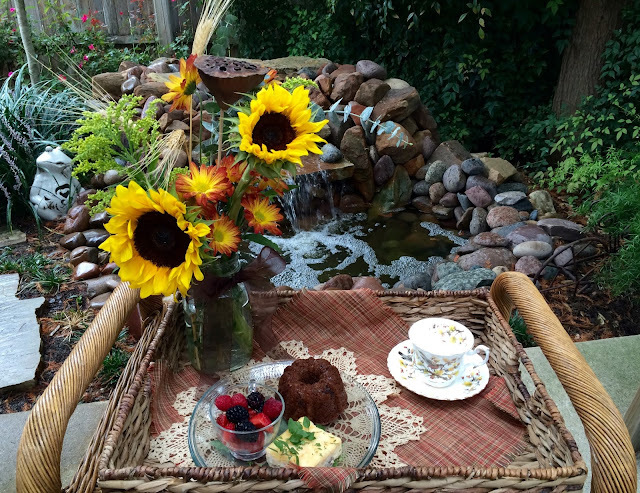 Brunch outside with the sunflowers and a pretty tea cup. That little mini bundt looks good too. What a thoughtful friend to gift you wish such a lovely teacup! Teacups with bird designs are a rare breed (at least in my humble experience...Hee!) and your robin teacup is definitely perfect for the fall. Hi Kitty, what a beautiful teacup and saucer. I love the pattern for fall. How special to receive from your friends mother's collection. 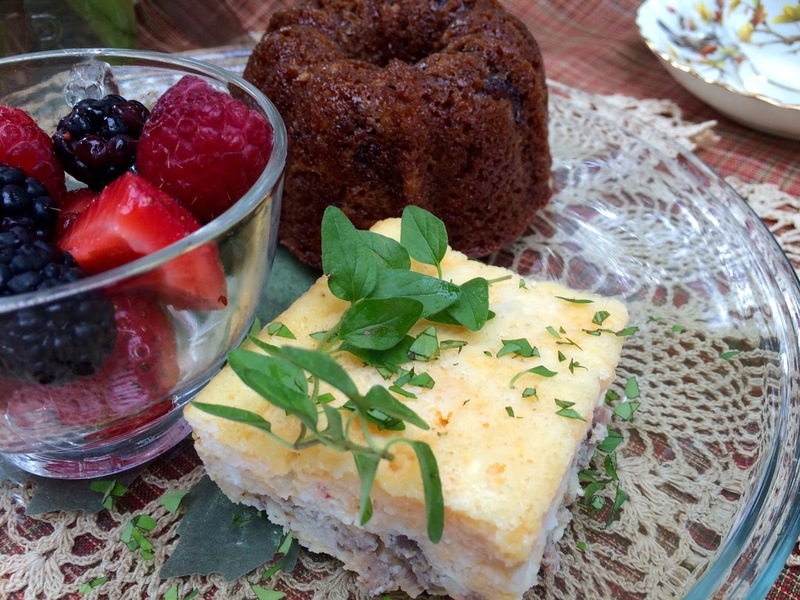 You have set such a beautiful fall table for tea and how delicious your quiche looks. I love the idea of freezing this for a make ahead breakfast. Wishing you a wonderful week as fall arrives. Our temps are a bit better and we are ready for cooler days. Have a wonderful week filled with blessings. Thanks so much for sharing the quiche recipe! I was thinking about the fact of whether it could be frozen or not and then you provided excellent directions ~ thank you! I do like to have something easy and healthy in the mornings with my coffee. Dear Kitty, thank you again for your comments and support. My sons are relieved to be home. They feel so blessed your house made it through the fire. Your teacup is so charming and sweet. The little bird makes me smile. Love quiche and this one is new to me. Love the idea of a crustless quiche! Even though I love to eat the crust, sometimes when I make quiche I'm disappointed in how the crust turns out. Great idea about cutting and freezing the quiche. I'm trying to eat more protein at breakfast lately. What a lovely teacup Kitty. Just right for autumn. hat sounds like a good recipe especially if it freezes well. Lovely teacup. Pinning to recipe board and teacup board.I am going to try the quiche -if I have the knack for making it I'm going to make it my my next coffee hour at church. Your quiche really sounds wonderful, and I love the idea of freezing it. I will certainly give that one a try. I too love to have my protein and this would be a great and easy way to get it. Your friend has graced you with a beautiful fall tea cup, I love it. I just love that setting by your water fall when you share pictures with us. Gorgeous! Have a most glorious day, my friend. Love that darling teacup and saucer Kitty! I like Stephanie, love crust, but I still will give this a try. I have a pretty oregano growing in a chippy urn. Having a woman's party for my family on the 3rd. Might be the perfect dish to make. Thanks for sharing with SYC. The teacup is so lovely and I love the leaves circling the saucer! Your quiche looks wonderful! Oh my that tea cup is just beautiful and just perfect for fall teas and coffee's, how sweet to share from her mother's cups! The teacup and saucer is very pretty, and perfect for fall! It was so very nice of your friend to give you one from her mother's set. The quiche looks so delicious...pinned! That looks delicious and I love the water feature in your garden! I'm back to blogging on Blogger. Tired WordPress but it was tricky. It certainly is Quiche Baking time here on the Prairie with our First day of Autumn Showers!!! Beautiful photos of your breakfast, dear one!!! Yum, and what a great idea to freeze it so you have it on hand. I have so much oregano - it truly tries to take over the garden. Terrific idea, Kitty. I'm going to make up a recipe and do the same. I like a quick, easy breakfast. The thought of your pretty tables set in the garden always makes me smile. Your fall tea cup and saucer are so pretty. A breakfast quiche without a crust that can be frozen in individual servings is a BRILLIANT idea! Oh Kitty your cup and saucer are just too pretty. 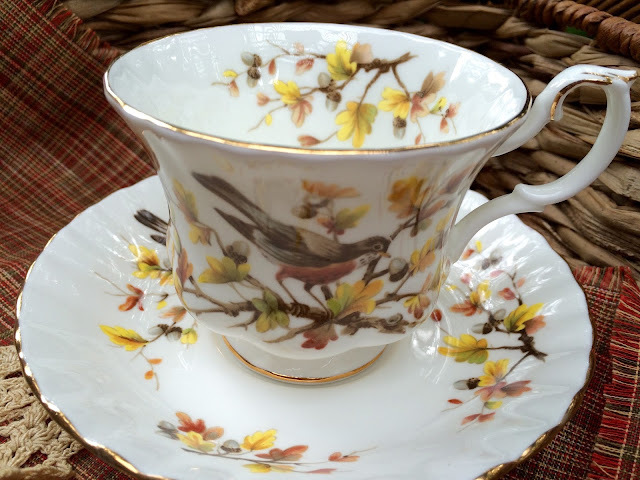 I love teacups with birds and this one is so perfect for fall. Your recipe looks fantastic. Happy fall. I love crustless quiche Kitty! This looks so good!